Vermeer (1632-1675) was a Dutch painter who made small smoothly-painted pictures of middle-class domesticity. You’ve probably heard of The Girl with the Pearl Earring. That was painted by Vermeer. Rembrandt (1606-1669) was another Dutch painter with a very different style and subject matter from Vermeer. His most famous painting might be The Night Watch but he had a wide and varied body of work (including a lot of self-portraits). Vermeer and Rembrandt were painting in the same country at roughly the same time, and their work couldn’t look more different. So I was on my way, in the National Gallery of Art, in Washington DC, to see this painting, Vermeer’s Woman Holding a Balance, which is roughly the size of my open laptop. I was psyched up for one thing but I was ambushed, en route, by something in a very different style, Rembrandt’s Lucretia. It’s about a meter wide, so the bodice alone is the size of the Vermeer. Zoom in on both of them. No, really. I’ll wait. 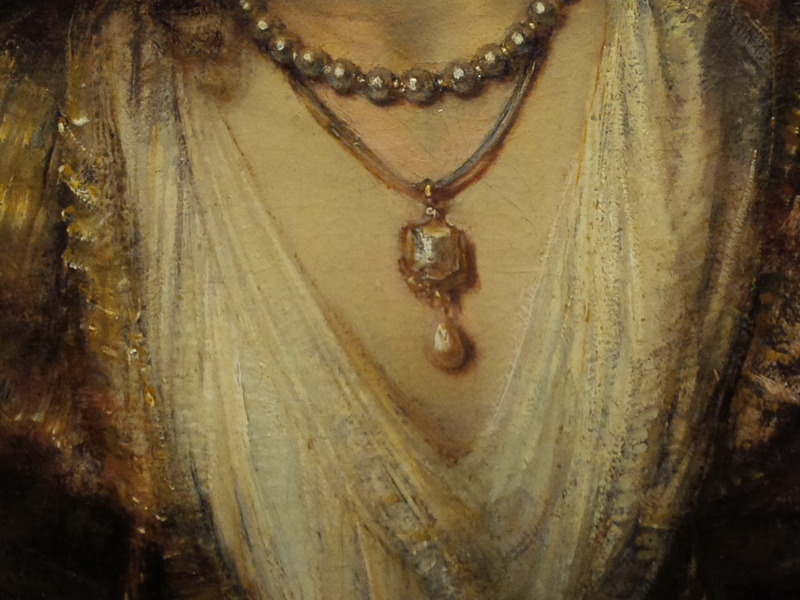 If you judge Rembrandt based on my cropped close-up smartphone snapshot, you don’t deserve to have Rembrandt. Or smartphones. Rembrandt gives a traffic-stopping master class in how, using whites and yellows and browns, to paint the effect of gold and brocade and pearls with bravura brushstrokes. Vermeer paints pearls and gold, too, but there’s nothing flashy or layered about it; it’s creamy and subtle. One’s fireworks, the other sleight-of-hand.